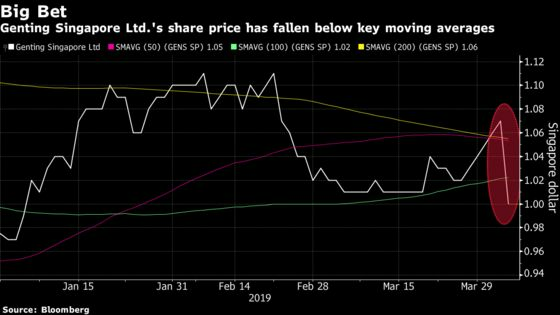 (Bloomberg) -- Genting Singapore Ltd.’s stock slumped the most in almost four years after a flurry of analysts downgrades, amid the city-state’s plan to raise gambling taxes and on concern about a S$4.5 billion ($3.3 billion) investment to expand its casino resort. The shares fell as much as 9.8 percent, the most since August 2015, after at least seven brokerages including Morgan Stanley and JPMorgan cut the casino operator’s rating on Singapore’s plan to raise taxes on gaming and increase entry prices for residents. 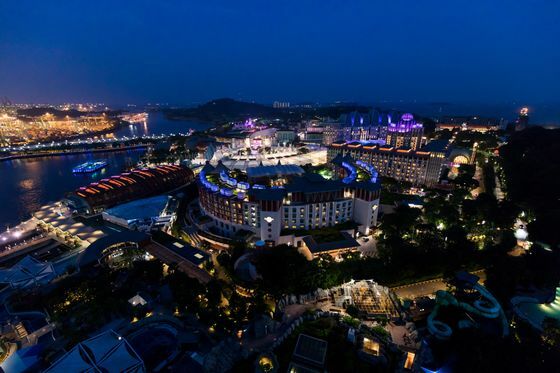 Genting Singapore said in a separate statement it will expand its Resorts World Sentosa over five years. Genting Singapore and Las Vegas Sands Corp. pledged to invest S$9 billion ($6.7 billion) in additional tourism attractions in the city-state, and won an extension on their exclusive gaming licenses until 2030. The additional investments by both companies are almost two-thirds of their initial amounts of about S$15 billion in 2006, the Singapore government said. The city-state also plans to increase tax rates on gross gaming revenue at the end of the current moratorium in February 2022, and raise casino entry prices for Singapore residents to S$150 from S$100 per visit. Morgan Stanley analysts Praveen Choudhary and Jeremy An, whose earnings estimates on the company are below consensus, cut the stock to equalweight from overweight, saying Genting will see a negative impact on earnings unless growth after the expansion is significant. The value of the company may drop by 9 percent due to fewer local visitors, a higher tax rate, and market share loss, they said. The expansion plans come with a "hefty price tag" amid unnecessarily large investments and unwanted regulatory changes, JPMorgan analyst DS Kim wrote in a note. The hikes in entry fees and the gaming tax will lower operating profit by about 4 percent and 6 percent, respectively, from the second quarter of fiscal 2019 and March 2022, the note said. Not everybody is negative on the higher taxes and expansion plan. Citigroup Inc. maintained its buy rating on the stock and raised the price target to S$1.28 from S$1.20. 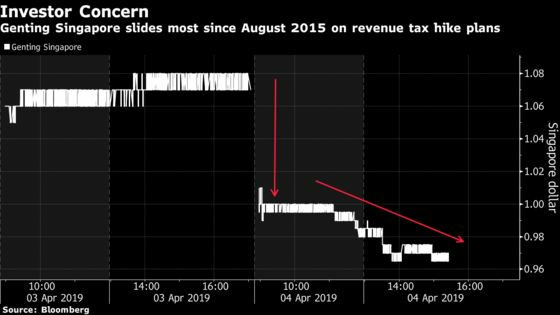 The higher gaming tax is "a very small price to pay for the opportunity to grow again in Singapore," Citigroup’s analysts led by George Choi wrote in a note on Wednesday. Bernstein analyst Vitaly Umansky said the expansion plan should be viewed as a long-term positive, outweighing the tax increases. Genting plans to utilize existing its cash balance, cash flows and project financing for its expansion, Umansky wrote in a note. "There should be no impact to dividends," and Genting will continue to pursue a Japan integrated resort opportunity, Umansky said.